A $500 reward for information leading to the arrest and conviction of individuals involved with tagging crews was announced last Friday by Alderman George Cardenas (12th Ward). Residents have called in and sent pictures of the graffiti around the ward. Alderman Cardenas recently had a meeting with the Commissioner of Streets and Sanitation to discuss concerns over graffiti. Additionally, Alderman Cardenas invested in ‘Tag-Away’, a graffiti remover, as a temporary measure. The sub-zero cold temperatures have caused traditional graffiti equipment to work improperly. Residents are encouraged to report any incidents of vandalism immediately to 911. 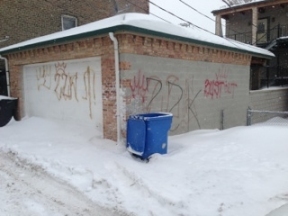 They are also encouraged to report new graffiti to the 12th Ward Public Service Office at 773-523-8250 as soon as possible.